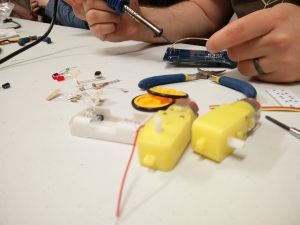 We recently ran a Electronic “Build-It” Workshop. We have twelve build a line following robot. The little robot was an all analog device, not an arduino insight. Check out the photos from the workshop in our gallery and the video below of them inaction. Join our mailing list to keep upto date with our workshops over the summer. This was written by tdr. Posted on Tuesday, May 17, 2016, at 12:15 pm. Filed under News, Project, Video, Workshops/Events. Bookmark the permalink. Follow comments here with the RSS feed. Post a comment or leave a trackback.